After four months of incarceration and another four months on house arrest, a jury found George “not guilty” on July 26th in his aggravated unlawful use of a weapon case. CCBF is thrilled that George, a 19-year-old father of an infant daughter, can now return to his family and life. At the same time, we are outraged that George was forced to endure eight months of devastating pretrial punishment for charges that he was ultimately exonerated of. Before he was arrested in November 2016, George was a senior in high school, working a regular job, and had just found out that he was going to be a dad. He was accused by police of having a gun in his possession and locked up in Cook County Jail with a bond of $50,000 dollars, even though he had no background. Unable to afford the $5,000 required for his release, George was incarcerated for four months under terrible conditions. During his pretrial incarceration, he considered taking a plea deal just to escape the situation. George says he wants everyone to know that jail is hell. On March 28, 2017, CCBF posted $5,000 to secure George’s freedom. After a pretrial services officer told his judge that George hadn’t contacted the office quickly enough after his release, George was put on electronic monitoring. Electronic monitoring (a form of house arrest) made it impossible for him to go to school, work a job, or financially support his daughter and girlfriend. Frustrated by restrictions on his movement and worn down by the criminal legal system, George—again—almost took a plea deal. Nevertheless, when he was finally went to trial, George prevailed! Now that his case is over, George plans to spend time with his daughter, stepson, girlfriend, mother, and siblings. Still, he lost eight months of his life to pretrial incarceration and house arrest—time that he can never get back. These conditions amounted to punishment meted out before trial, and highlight the problems of pretrial “services” or incarceration based on certain allegations such as gun possession. George’s case exposes the brutality of a system that punishes people before they have faced trial and reminds us that when the system doesn’t succeed in forcing a plea, some people will be found to be innocent of the charges against them. It further highlights how the criminalization of guns is not and will never be a real solution for addressing social harms, and instead only gives prosecutors and police more ammunition for imposing punishment—even before individuals have been convicted. George wants people reading his story to understand that this could happen to anyone in the wrong place at the wrong time. 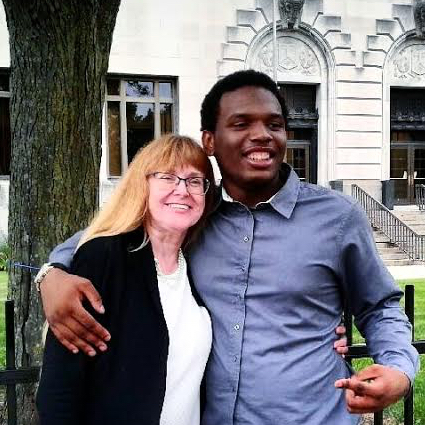 This is a photo of George and one of his lawyers from the Cook County Public Defender’s Office, who won the jury trial.